Tobacco Free Tennis! I Find This Amusing. | Sack-Vegas!!!! 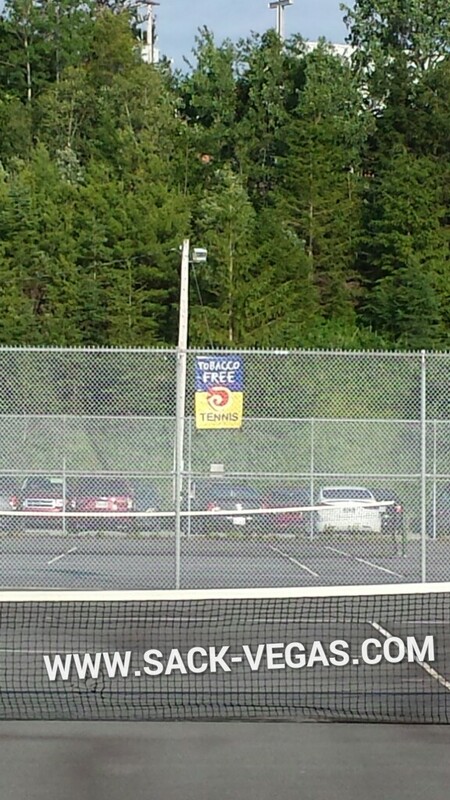 Tobacco Free Tennis! I Find This Amusing. “The last time I played tennis, my opponent wore cut off jean shorts and smoked as he played”. This was over 20 years ago and it got a few chuckles. I *really* chuckled when I saw this sign down at Les Mayo fields tonight! Is smoking on the courts an issue? Do we actually need to be told not to smoke as we play? Are people chewing and spitting? Many questions!! Posted by Sacky on July 7, 2014 in Ramblings And Foolisness. We had the same thing for soccer. Mind you, the players were children and the signs were meant for the parents who puffed away while watching the kids play. I would assume the same thing here. Parents set the example their children follow.